In every community, every day, you’ll find a circle of heroes keeping all those with food allergies safe. 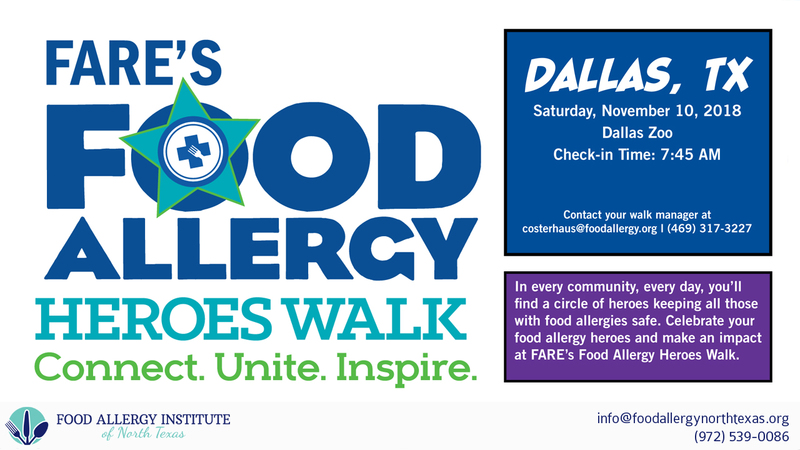 Celebrate your food allergy heroes and make an impact at FARE’s Food Allergy Heroes Walk at the Dallas Zoo on November 10. Celebrate your food allergy heroes and make an impact at FARE’s Food Allergy Heroes Walk. Our walk exists to recognize the courage and determination of food allergy families and to empower these everyday heroes to help keep families managing food allergies safe. Through widespread fundraising and walks across the country, thousands of families come together to unite behind their commitment to FARE’s mission of life, health, and hope and raise funds that will change their children’s lives through research, education, advocacy, and broad awareness.